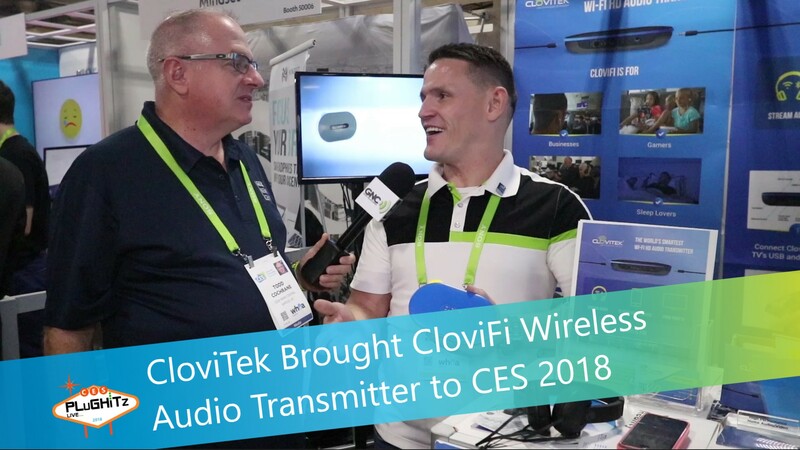 CloviTek is the creator of CloviFi - the world's smartest wireless audio transmitter. It is ideal for consumers, seniors, people who struggle with hearing loss, and businesses in public places. Todd visited the CloviTek booth at CES 2018 and spoke with Vitaly. He discussed the CloviFi audio distribution device. It is a Wi-Fi transmitter that can transmit audio from your TV to your mobile phone. The device has a Bluetooth transmitter. CloviFi is a great solution for households where someone wants to watch TV while other people are sleeping or studying. Connect CloviFi to one of the audio inputs on your TV. Power the TV on, then connect CloviFi to your Wi-Fi home network. Launch the mobile app to start transmitting audio. CloviTek estimates that the retail price range will be from $100 to $150. They estimate that it will take about three months before they can start shipping.